I did a walk last autumn, spent the whole of September and October following the M62 corridor all the way from Hull back home to Liverpool, and reflecting back on that adventure now, I realise that one of the inspirations for my journey was Bill's quote. It struck a deep chord in me. Helped confirm for me the direction my route should take. ... the motorway journey is full of smells, sounds, and tactilities, producing a corporeal sociality that inheres in the intimate relationship between bodies and cars and the spaces through which they move, the distinctive roadscapes, particular models, road textures, and driving conventions and habits. On my motorway walk I spent hours standing on bridges above the M62, watching thousands of people pass beneath. I was a vulnerable pedestrian standing nervously on a thin metallic construction which shuddered with the eddying currents sent up by every container wagon, 4-by-4 and saloon car. I looked at the intensity in the drivers' eyes as the road reared up before them at 70 mph plus, and - aligning myself with the conventional view of what these drivers were doing - I interpreted their look as a dullness, a deadness, a switched-off state. Tim's passionate discourse on the subject, though, has helped me to realise that actually there was a lot more going on for those drivers just then, that they were each performing all the minute physical and mental functions required to help them through that particular passage, and relating to their surroundings, wondering about the bloke they'd seen above them gripping tight hold of a camera he was pointing towards them as they passed. In The Art of Travel Alain de Botton described the service station as 'like a lighthouse at the edge of the ocean, it seemed not to belong to the city, nor to the country either, but rather to some third, traveller's realm.' Gripped by this sense of the exotic which service stations have, and inspired by Roger Green's enthusiasm for the richness and potential in such places, I made it a feature of my cross-country walk through the urban north of England that I would spend many nights sleeping in motorway travelodges, the leather chairs at Coffee Primo making a comfortable base where I could blog my journey on my laptop of an evening. Because it's beautiful. Because it's fascinating. Because it is an arena of deep sociability and latent spirituality well worth exploring, slowly, thoughtfully, creatively. It was obvious, therefore, that the best way to come to terms with this beast was to walk it. To set out, counterclockwise, from Waltham Abbey, and to complete the circuit before the (official) eve of the New Millennium. On my walk I left the motorway to spend a week in central Leeds and enjoyed a full and fascinating day with members and friends of the theatre companies Imprint and Pointed Arrow, whose productions often involve journeys, are concerned with 'explor[ing] what it means to connect with our land, its history, people and stories... [this is a] political theatre ... interested not only in events, but also in ... movement' . Pointed Arrow people talked about their Pilgrimage project in 2004 in which they had travelled along the Great North Road - the A1, from London to Edinburgh, performing a play about the stories connected with the road, and exploring British national identity - and inevitably their own identities - as they went. And in central Manchester - where again I spent a rewarding week doing circular walks in city spaces - I was joined by another performer, Phil Smith. Earlier in the year I had joined Phil as he walked the roads between Manchester and Northampton retracing the steps of a man called Charles Hurst who a century earlier had travelled that way laden with a big box of acorns which he planted as he went. Among the advantages which I have gathered from my tour, I count as not the least the proficiency I have acquired in the gentle art of strolling. I can now perform a feat which I believe few townbred men could accomplish with ease of grace: that is, to walk a good English mile in an hour. This is not quite so easy as it may appear. I therefore set down a few observations on what is fast becoming a lost art. Because it gives you plenty of time and imaginative permission to explore the joys, riches, and complexities to be discovered in each good English mile. In Manchester Phil and I spent one day walking miles in search of Boggarts - which, for the uninitiated, are sprites, mischievous spirits mainly found in Lancashire and Yorkshire, often thought to be responsible for poltergeist activity and pranks like turning the doorstep milk sour, making things disappear and causing dogs to go lame. Boggarts reside in mossy places - and north-east Manchester is surrounded by mossy places. The B&B we were staying in backed onto the evocatively-named Boggart Hole Clough, a public park which was spookily shrouded in mist on the morning of our walk, and suggested the theme to us. It made for a good day enjoying looking for the mystery in the urban, exploring the deep connections between geography and psyche, landscape and spirit. Messing about with the roadside moss. Thoughtful commentators have noted how this might connect with Manchester's recent story of rigourous regeneration, which might be said to have been sparked by the ignition of the IRA bomb at the Arndale Centre in 1996. ... The lady at the Sportcity Visitor Centre repeated a view that I've heard before, numerous times, from Mancunians: that terrible though it was, the bomb woke the city up. It fired an explosion of vital new beginnings. "And no-one was killed," she said. This suggested another walk to us, which we did the following day - a walk from the outskirts of the city right into the epicentre of that IRA bomb, outside Marks and Spencers in the rebuilt Arndale Centre. It was a walk in which we were searching for the 'spark' in the city, the places where the vital energy of Manchester seemed to be. Inevitably perhaps we didn't find much of that sort of energy in the Arndale, bustling though it was. The nearest we got to some sort of a Mancunian buzz was behind the modest shopping square in forgotten inner-city Collyhurst where on a hill called Red Bank, overlooking the tower blocks of the city centre, there was ample evidence - fag ends, crushed cans, crisp packets - that people often enjoy sitting around the funny sculpture on the hilltop, soaking in the fantastic view, and revelling in each other's company. And I sensed that these hilltop soirees must ignite a hundred small sparks - of light, love, ideas - in those who share them. The legendary toothless footballer Nobby Stiles and the marvellous gurning comedian Les Dawson both came from Collyhurst, I later discovered. Exactly the sort of modest place which occasionally sparks real genius. Because it can radicalise your view of life as you take a fresh look at the details of the mundane. When I started planning this walk about three years ago I wasn't then aware that the sort of processes I was embracing could be given a name. But in that short period I've become well acquainted with the term psychogeography. Guy Debord described psychogeography as "the study of the precise laws and specific effects of the geographical environment, consciously organised or not, on the emotions and behaviour of individuals." It is not a precise science, psychogeography, more a strategy for engaging with ordinary life in ways which subvert the alienation most of us experience. Debord suggested that the alienation we see and feel is a consequence of the economic form of social organisation which has reached its climax in capitalism. Our world, our city, our street, are mediated to us through a lens shaped by the priorities of capital, which Debord named 'the spectacle'. The spectacle: the way we only see the world how the forces of capital want us to see it. This debilitates us spiritually, and in reaction against this the Situationist International devoted themselves to finding ways of 'reclaiming individual autonomy from the spectacle'. As an organisation the Situationists were short-lived and somewhat - probably deliberately - ramshackle. But they did champion a cause which many continue to embrace, a cause which might be affirmed by anyone remotely sympathetic to the theology of the kingdom of heaven, as explained in the gospels. The gospels, or instance, record the statement, 'Give to Caesar what is Caesar's, and to God what is God's'. [Matthew 22:21], through which we find Jesus liberating his audience from the influence of the spectacle, breaking the domain of the occupying power by subverting the very mechanism of their oppression: the tax system. Notice, by the way, where Jesus was and what Jesus was doing when he had this radical conversation - he was wandering about the streets of the city. The Situationists introduced some strategies to help people shake off the influence of the spectacle, notably strategies which involved wandering about city streets. The Situationists introduced a strategy called the derive, which is basically an aimless walk, probably through city streets, that follows the whim of the moment. The joy of the derive - usually translated into English as a drift - is that it is not provoked by concerns like getting to work (commuting), or getting to the shops (consuming). The derive opens the eyes and heart of the deriviste to a liberated journey. The streets look different when you're drifting them. Others, directly or indirectly, or maybe not at all influenced by The Situationists have embraced the drift and created other similarly liberating strategies for walking. In an Exeter Mis-Guide, published in 2003, and their follow-up A Mis-Guide to Anywhere, 2006, a collective of tricksters, urban theorists, performers and artists calling themselves Wrights and Sights offer to readers 'travel documents for directionless journeys'. Directionless, but not pointless, for rather than doing what conventional guidebooks do - direct people to the reception desks of hotels and the booking offices of theatres - the Mis-Guides give people the permission and the tools to explore the city on their own terms, in new and creative ways. As well as visiting Veitch's gardens at Killerton, look in Exeter for plants in unexpected places ... wild flowers growing in industrial estates, building sites, road verges. Rather than looking in the civic centre at statues of the great and good, instead trace a shape of a person onto a map of the city - maybe your shape. Walk the route you have marked. You have now mapped your body onto the city. Ask a friend to drop you at the airport. From there, catch the cheapest form of transport back into town, then make your way to a backpacking hostel of your choice and check in. Spend your time eating backpacker meals (pizza, falafel, takeaway curry) and doing backpacker activities with other backpackers - sightseeing, beer drinking, surfing the Net in Internet caf�s, having meaningful discussions and even romantic liaisons with fun and attractive people you've just met. Watch your budget, and be sure to take photographs of yourself with your new friends. When you've had enough, make your way back to the airport and ask someone to collect you to take you back home. There is a politics to all these ways of walking and seeing, sensing and walking and I'm just beginning to wonder how closely these politics might be linked to theologies of liberation, green theologies, theologies rooted in the minutiae of particular places which critique the way we're normally encouraged to see them and challenge us to liberate our hearts and minds about our everyday environment. To try to begin applying some of this theory, however shakily, to see how it sits. Here's an extract from the diary of my walk, Ferrybridge to Castleford, 25 September 2007. Back onto the motorway route today, on a stretch of country busy with industry. Junction 33, Ferrybridge Services: a tatty-because-well-used service area, in which business is done out of the back of vehicles, men sit alone consuming overpriced refrigerator-packaged food, women serve at tills or as Travelodge bedders, young people from nearby run-down Ferrybridge Hill hang about and police and private security patrol the area attempting to alleviate the fear of car theft held by employees and regular users of this place. Little endearing about Junction 33, Ferrybridge Services on a wet Tuesday morning. It will cheer up, though, with the arrival of elderly folks' coach parties later today and hen parties at the weekend. Junction 32, Outlet Village: not a place I stop at today, having already done that at the peak of the retail week, on my inward journey to central Leeds two Saturdays ago. Noticing the scale, though, of the neighbouring Xscape, where people I know come from as far away as Liverpool to practice on the ski slopes. People I don't know come, I guess, from nearby Castleford for the cinema, skate park and bowls. It's quite a thing to have on your doorstep, though it does make the facilities of the town of Castleford seem feeble by comparison. Castleford town centre: Nice seats, though, in the pedestrian area between the Co-op and Marks and Spencer. Lots of them, including single circular ones set in threes which pivot so you can either face inwards for a chat with friends, or spin away to turn your back on a stranger; all being well used by folks of all ages and types (self included) on a suddenly hot, sunny Tuesday lunchtime. A young woman clips through the seated Castleford citizens asking them questions about what might be a local redevelopment issue, making copious notes on an A4 lined pad, and in one case taking their pictures. I imagine she is a keen young local journalist. I spin my seat in her direction hoping for an interview which would be more for my benefit than hers but she heads into the Co-op instead. Through the lobby of the Burberry factory on Albion Street rows of machinists are visible, working hard on the autumn/winter range. Despite (or maybe because of) the presence of a Factory Shop, and despite (or maybe because of) reports to the contrary (in 'chav hate' websites and sneering tabloid feature articles) it seems that no-one in Castleford is wearing Burberry. However on Bridge Street Penningtons Sporting Arms and Ammunition are trading in guns, crossbows and knives, which is enough to alert a stranger to possible dangerous traits in the local culture. Junction 31, Wakefield Europort: today's destination and one of the most-anticipated visits of my entire walk. In my mind I'd pictured Wakefield Europort as a vast area chaotic with articulated truck activity, a motorway hell-zone. I'd imagined I'd be risking my skin walking into an area designed for massive speeding freight carriers. Perhaps it was the onset of the sunshine after Ferrybridge rain, or some other sort of reverie, but I found that at the major junction at the convergence of the motorway, Europort approach road and the A655, the traffic flowed smoothly through multiple lights and across numerous lanes; crossing it on foot was easy. And the Europort, though busy and vast, had a calmness about it which disarmed me, then pleased me. Servicing giants like Argos, TK Maxx, DHL, Royal Mail and Asda, many lorries sped past me along California Drive, Expressway and Tuscany Way. But as they drew into their termini they seemed to be swallowed into a silence; inside those massive sheds (which cover acres and acres of low common land) it seemed that the hand over systems flow smoothly. In the long walk alongside Asda all that I could find to photograph were the shining white sides of the distribution centres resting like gentle rocks beneath a generous white cloudy sky. If I were to compose a prayer for Junction 31, I thought, on the walk back, it would be a reflection on the realities of requesting Give Us This Day Our Daily Bread, because it all comes from here, this vast inland petrol-propelled port: bread (Warburtons), drinks (Scottish and Newcastle), groceries (Asda), clothes (TK Maxx), toiletries (M&S) and any other household goods you can think of (Argos); but then a long tailback of parked lorries obstructing California Drive demonstrated what happens when systems go wrong. Waiting for delayed access to the rail freight terminal the drivers' hunger and thirst were serviced by a burger man in a white caravan signed PETE'S EATS. Pete's presence indicates that this delay happens regularly. However the rail freight centre seems to be getting a makeover, there are signs of expansion and notices clipped to lampposts about further works, so perhaps the queues will stop and Pete will have to find another pitch. Even this queue, though, seemed calm enough, beside one driver blasting his horn. And the atmosphere was easy inside the Whitwood Transport Cafe, a light, clean and generously-proportioned place which did a good bacon butty and mug of tea for me, and offers the drivers who use it some very good facilities - showers, a TV room, pool table, decent toilets and a bar. As haulier Colin told me, drivers generally get a very raw deal, in working, resting and eating conditions, so Whitwood - not out of place at Junction 31 - is to be applauded. To take time in the spaces and places where hardworking people - and workless people - spend most of their days, to appreciate and celebrate them. For the journey itself and the enjoyment of writing about it - in the tradition of many literary travellers and published psychogeographers. To explore and provoke and mess about to see what would happen - in the tradition of many artists and playwrights of the road. To attempt a bit of theology without using exclusively theological language. To explore a sort of spirituality without defaulting to the standard methods and sites and texts usually available in that arena. I think I succeeded in doing that, not sure about all the rest. But the journey of exploring and celebrating what last Greenbelt we called 'heaven in ordinary' - that's a very valid journey to take; I'm pretty confident that I'm not the only person who thinks so. 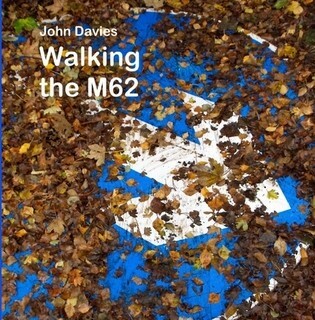 It was really good to share parts of my M62 journey with many Greenbelters who'd first contacted me through the festival - or at the festival - offering accommodation or company, or conversation or critique or other sorts of help on the road and in the time since. Thanks, again, to those here who did that. I hope we'll continue in sharing that journey together.